The Dominican Order was established in 1216 by St Dominic. He had discovered his vocation in 1205 when Dominic and Diego, the bishop Osma in Spain, were travelling together to Denmark to arrange a marriage between a prince of Aragon in Spain and a princess of Denmark. On the way there, they stopped off in an inn for the night in the South of France. Dominic got talking to the innkeeper who, previously having been a Catholic, had now joined the Cathars. This was a sect which had a dualistic theology believing in a God who created all things spiritual and the Devil who created all things material. Dominic engaged the man in discussion all through the night. In the morning, the innkeeper had returned to his Catholic faith. This incident and others like it spurred Dominic and Diego to join a preaching band in the South of France to bring people back to their Catholic faith. Out of these efforts, the Dominican Order was born. Dominicans are comprised of Dominican priests and brothers, contemplative nuns, congregations of sisters and lay people. Altogether we are the Dominican Family. Dominican life is based upon four pillars: Prayer, Study, Community life and Proclaiming the Gospel. 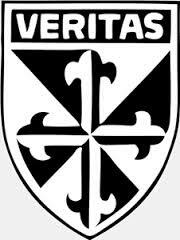 The purpose of Dominican life is to praise, to bless and to preach (laudere, benedicere and praedicare) and to live by Truth – Veritas. Dominicans have been involved in preaching the Gospel in a variety of ways. In South Africa, Dominicans are involved giving retreats, in preaching on Radio Veritas, teaching at universities in South Africa and Malawi, working in parishes in Johannesburg and Welkom, working with orphaned and vulnerable children as well as working in the field of education. 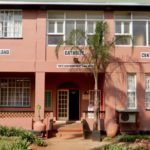 Similarly in Eswatini, the Oakford Dominican Sisters were involved in St Theresa’s School for Girls for many years and the Cabra Dominican Sisters started the Deaf School in Siteki. Previously, the only Dominican priest to work in Eswatini was Fr Oswin Magrath OP who came as Bishop Zwane’s secretary and was also chaplain at UNESWA. My presence here in Eswatini continues in part of this tradition. I am working as Chaplain to the Deaf here in the diocese. Presently, I say Mass in sign language every second and fourth week of a month. The other weeks are integrated Masses with hearing and Deaf together. 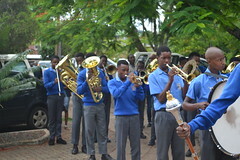 Simangele Dlamini interprets for the Deaf during the Mass.